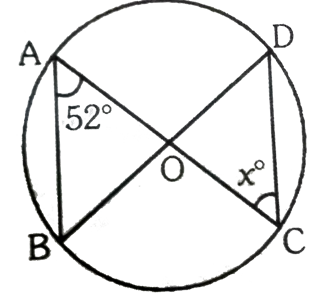 What will be the ratio of the sum of the interior angles and that of the exterior angles of an octagon? If the angles of pentagon are in the ratio 1:2:3:5:9, then what is the value of the least (smallest) angle? What wil be the number of diagonals in a regular hexagon? 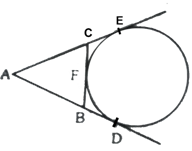 AB is the diameter of the circle and O is its centre. CD and AB intersect in such a way that OE=EB and CE=6 cm, ED=2 cm. Find the radius of the circle . In the given figure O is the centre of the circle then value of x is ? What will be the value of x in the given figure? In the adjoining figure the value of x is ? 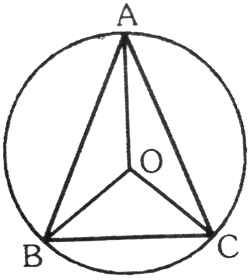 A secant drawn from an external point O, intersect the circle at A and B, such that OA = 4cm, OB = 9cm. Then what will be the length of the tangent drawn from this point on the circle? Two equal circles with radius r intersect in such a way that they pass through the centre of each other. Find the length of the common chord.